UTA is among the leading academic institutions for students who want to pursue graduate degrees in education or nursing online, according to new national rankings for 2016. 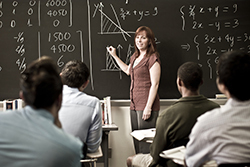 U.S. News & World Report ranks UTA's Master of Education degree No. 30 among 267 schools surveyed on its 2016 list of Best Online Graduate Education Programs. The Master of Science in Nursing degree is ranked No. 54 among 149 surveyed on its Best Online Graduate Nursing Programs list. Read more about the U.S. News & World Report's graduate program rankings. 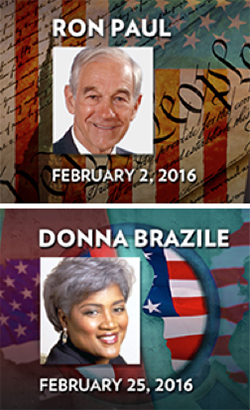 Tickets are available online to see Ron Paul and Donna Brazile in the next two Maverick Speakers Series events. A former congressman and physician, Dr. Paul will speak on "Liberty Defined: The Future of Freedom" at 7:30 p.m. Tuesday, Feb. 2, at Texas Hall. A question-and-answer session and a book signing will follow the lecture. Paul enjoys a national reputation as a premier advocate for liberty in politics today. Since his retirement from Congress, he has continued to work for limited constitutional government through organizations he founded, including the Foundation for Rational Economics and Education (FREE), Campaign for Liberty, and the Ron Paul Institute for Peace and Prosperity. He recently launched The Ron Paul Liberty Report, an online network airing original programming on today’s most pertinent issues. Paul is the author of several best-selling books, including the recently released Swords Into Plowshares, which offers a personal reflection on American's history of war, foreign intervention, and prospects for peace. Political strategist and commentator Donna Brazile will discuss "Politics and Beyond" at 7:30 p.m. Thursday, Feb. 25, at Texas Hall. A question-and-answer session will follow the lecture. Tickets for "Gombe and Beyond: An Evening with Dr. Jane Goodall" will be available Tuesday, March 1. Dr. Goodall will speak at 7:30 p.m. Thursday, March 31, at College Park Center. 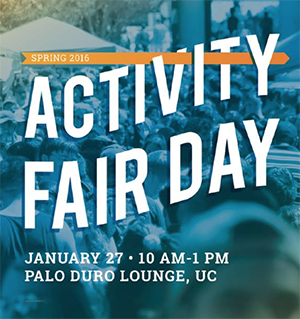 University departments, programs, and student organizations are encouraged to host an information table at the spring Activity Fair Day on Wednesday, Jan. 27, in the E.H. Hereford University Center. Register online by Monday, Jan. 25. 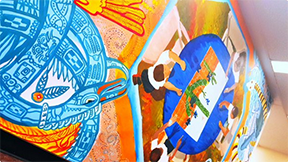 A colorful mural in the Central Library's basement reflects the different cultures in Texas: African, Chinese, Mexican, and Native American. Artist Mary Orozco also included symbols of air, earth, water, and fire using the style of those cultures. The Office of Graduate Studies is now accepting nominations for the 2015-2016 Excellence in Doctoral Student Mentoring Award. The deadline for nominations is Friday, Jan. 22. The awards alternate annually between the science and engineering disciplines and from the liberal arts and professional disciplines. For the 2016 award, nominations are being accepted from the College of Architecture, Planning and Public Affairs; College of Business; College of Liberal Arts; College of Nursing and Health Innovation; College of Education; and the School of Social Work. Start by taking three selfies at the College Park District's restaurants within the first two weeks of the semester. Enjoy great dining at Pie Five, Texadelphia, Coolberry Frozen Yogurt, and Starbucks at the UTA Bookstore. The Parent Mavericks program hosts a Valentine's Day breakfast for the family at 9:30 a.m. Saturday, Feb. 13. Students can bring up to three guests to the event on the second floor of the Maverick Activities Center. UTA closely monitors severe weather forecasts and will notify all students, faculty, and staff should local conditions affect the status of the University, including classes, programs, events, and activities. The Central Library now lends phone chargers, USB cables, and accessories at the first floor circulation desk. The cables include micro USB, micro USB 3.0, iPhone 5 and 6, iPhone 3 and 4, and USB wall chargers. With these cables you can upload and download data and charge your phone or device with a wide variety of Android and Apple products. The cables soon will be available at the Architecture & Fine Arts Library and the Science & Engineering Library. Late registration for spring semester. Employees—Employee Assistance Program (EAP) is provided through UTA’s Office of Human Resources at 1-800-343-3822 or visit alliancewp.com. Students—Drug and alcohol counseling and referral services are available through UTA Health Services at 817-272-2771 or visit uta.edu/healthservices. 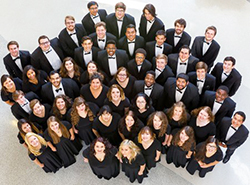 UTA's A Cappella Choir performs with the Dallas Symphony Orchestra in a Gershwin tribute Friday-Sunday, Jan. 22-24, at Meyerson Symphony Center in Dallas. Tickets start at $34 and are available at www.mydso.com. This is the choral group’s second appearance with the DSO. In June 2015, members of the choir appeared with the Rolling Stones in concert at AT&T Stadium in Arlington. Karen Kenaston-French, associate professor of music, directs the choir. Tickets start at $34 and are available at mydso.com. For times and ticket packages, visit the DSO website. Basketball Doubleheader Mavericks vs. Arkansas State. National Hugging Day attempt for Guinness World Record, Blue Out. Knit caps for first 150 students and UTA Koozies for first 250 fans. Meet the 2016 Maverick baseball team. Tickets $3 students, $7-20 general public. Women's game 5 p.m., men's game 7:15 p.m., College Park Center. Athletics. Friday Night Film: ‘Bridge of Spies’ Rated PG. Free popcorn. Concessions for sale. $1, $1.50 with credit card. 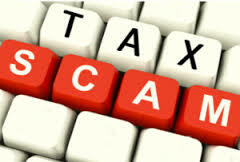 8 p.m., Rosebud Theatre, E.H. Hereford University Center. EXCEL Campus Activities. Basketball Doubleheader Mavericks vs. Arkansas-Little Rock. Carnival Day, Blaze's Kids Club Day. Meet the 2016 Maverick softball team. Tickets $3 students, $7-20 general public. Women's game 5 p.m., men's game 7:15 p.m., College Park Center. Athletics. Women's Tennis Mavericks vs. Tarleton State. Free. 10 a.m., UTA Tennis Center. Athletics. Faculty Recital: 'Mad Songs' David Grogan, assistant professor of music, leads a faculty recital that reflect a slightly less-than-sane view of the world. Performers also include Anne Healy, assistant professor of theatre arts, and Charlene Sutton, Laura Warriner Bray, Anne Marie Boeding, Nicholas Garza, and Clinton Bray. Free. 7:30 p.m., Irons Recital Hall, Fine Arts Building. Music. Study Abroad 101 Info Session Noon, Sabine Room, E.H. Hereford University Center. Also noon, Thursday, Jan. 21, Sabine Room, and 5 p.m. Monday, Jan. 25, Neches Room. Study Abroad. Winning season: Scott Cross, top, is now the winningest men's basketball coach in UTA history. Softball coach Kristie Fox, center left, was named an assistant coach for the USA team for the World Cup of Softball XI this summer. Movin' Mavs assistant coach Juan Soto, center right, was chosen to play for the Army in the 2016 Invictus Games on May 8-12 in Orlando, Fla.
Scott Cross sits alone as UTA's all-time winningest coach after the Maverick men’s team beat Georgia State 85-70 in the Sun Belt opener Dec. 30 at College Park Center. Since then, Cross and the Mavs have added more wins. Cross is now 166-131 in his 10th season as head coach, surpassing Eddie McCarter (162-199), who coached 1992-2006. Cross played for and was an assistant under McCarter. UTA is 13-3 for the first time in program history after winning 71-67 over Appalachian State last Thursday. The team beat Georgia Southern 92-72 on Jan. 2. The Mavericks were on the road to beat Troy 90-63 Thursday, and fell to South Alabama 88-85 Saturday. The team is 4-1 in Sun Belt Conference play. The Mavericks have the home court advantage for doubleheaders against Arkansas State on Thursday, Jan. 21, and against Arkansas-Little Rock Saturday, Jan. 23. Both start at 5 p.m. at College Park Center. Maverick softball coach Kristie Fox was named an assistant coach for the 2016 USA Softball Women’s Elite Team. Fox will help lead 18 players to compete at the World Cup of Softball XI this summer. The team will play a series of exhibition games against the Women’s National Team and at the USA Softball JO Cup in Marietta, Ga.
Fox served as an assistant coach for the 2015 Junior Women's National Team that took home goldat the Junior World Championship in Oklahoma City, Okla.
UTA women's tennis enters the season with a pair of doubles squads ranked in the ITA Tennis Top 10 in the Texas region. Angeles de los Rios and Astrid Gehre are fourth in the region and tied for 59th in the nation, while de los Rios is ninth when playing with Agustina Serio. The team opens the season Saturday, Jan. 23, against Tarleton State. The match is the first of six consecutive at the UTA Tennis Center through Sunday, Feb. 21. The Lady Mavs basketball team plays home court doubleheaders against Arkansas State on Thursday, Jan. 21, and against Arkansas-Little Rock Saturday, Jan. 23. Both start at 5 p.m. at College Park Center. Tickets are available at utatickets.com. The team tallied up three wins and three losses during the winter break. The team won 51-47 against UT San Antonio on Dec. 21, 70-31 over Georgia Southern on Jan. 2, and 76-45 over Appalachian State last Thursday in Sun Belt play. Georgia State won 68-63 on Dec. 30, Troy scored 88-71 last Thursday, and South Alabama totaled 59-55 Saturday. The women are 7-8 for the season and 2-3 in Sun Belt Conference play. 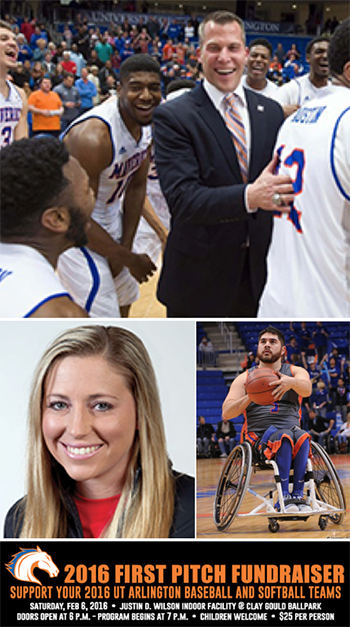 Lady Movin' Mavs Rose Hollermann and Abigail Dunkin and former Movin' Mavs Mikey Paye, Jorge Sanchez, and Aaron Gouge were selected to the USA National Wheelchair Basketball Team, which will play in the 2016 Paralympic Games on Sept. 7-18 in Rio de Janeiro, Brazil. Assistant coach and former Movin' Mavs All American Juan Soto was chosen to play for the Army in the 2016 Invictus Games on May 8-12 in Orlando, Fla. Soto will represent the Army in wheelchair basketball and wheelchair tennis. Season tickets for UTA baseball and softball are now on sale at utatickets.com, with single-game tickets available Tuesday, Feb. 2. Baseball season ticket for 30 home games are $75. Softball season tickets for 28 games are $75 for reserved seating and $40 for general admission. The men's track team won and the women's team came in second at the Texas A&M Team Invitational Friday-Saturday in College Station. Men's tennis players played against Rice in Houston on Sunday.